As the starting time for the match approached, stadium personnel were making sure everything was ready before the crowds came in. The TV crews made sure their equipment was hooked up and transmitting. The concession stand was staffed and full of team merchandise. The medical crew was set to handle any injuries, the ticket takers were ready for business, and a trusty security guard was already passing by on his rounds. The signal came from stadium management, and the eager crowds rushed forward to buy their tickets and merchandise before settling in to an exciting match. 3408 covers the one gap that really existed in the World Cup sets: a spectator entrance. This set tries to be even more ambitious, as it combines a souvenir shop, a TV film position, a medical facility, and stadium seating all into one package. As is usually the case when this happens, quality in all parts is neglected as the cost of quantity. Let me address each part individually. The ticket booths are on either side of the arched entrance. It uses 1 x 2 mini train windows as for ticket windows mounted on computer monitors. This would look okay, if only there were walls around the rest of the booths! Any criminal would have an easy time robbing the gate (maybe that's why there are so many police in Legoland... hmmm). A helicopter rotor is mounted as a turnstile, which is a nice idea. This makes up the middle section of the set. The souvenir shop is under a section of overhead seats and is a walk-through shop. There are two baseball caps, a videotape, and a red pennant for sale. No place for a clerk to stand, though. Maybe it's all free? A seating section is made of a 6 x 8 plate that sits on top of the shop, and is removable (presumably to make restocking the shop easier). It does come with a nice 2 x 2 printed sign pointing out the shop's location. The third part is the medical area, TV stand, and announce booth. The lower section makes up the x-ray area. Nothing special here, except the printed clear piece that shows a fractured mini-fig leg x-ray. A cart carries a stretcher out to the field, and it's manned by a Res-Q member. On top of this sits the announcer's booth, which has a half-finished and very open look to it. On top is the rotating area for the TV cameraman. 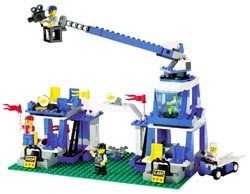 It uses an extendable arm with basket attached (like the new fire truck) to allow the cameraman to cover the field. This set tries hard but embodies the essence of Town Jr. It gets most of the little details right, but the big picture is sorely lacking. Mine didn't remain in it's standard form for long, as I built up and around the ticket windows, extended the shop to allow for a clerk and more merchandise, and gave the medical crew a little more room. Unless you want this set to look half-finished, plan on putting in some extra work and pieces to make it look like the real thing. 24 readers have rated this set as 3.81 out of 5 stars.